Detroit is making something of a comeback. Or to be more precise, certain areas of Detroit are making something of a comeback. The downtown area and the area just north of downtown formerly known as either the University District or the Cass Corridor and now rebranded as Midtown have attracted a lot of business investment, police protection and new residents and customers from the suburbs and other places. And certain high profile neighborhoods (Indian Village, Boston-Edison, Palmer Woods, etc) have seen bidding wars for area homes. However those sections of Detroit have always received a fairly outsized amount of attention and resources, even under previous mayors. Those areas were like Detroit's living room. If you have guests over and don't have time to clean or repair the entire house, then at the very least you will clean your living room as that is likely the first area your guests will see and where they will spend most of their time. Hopefully they won't venture into the kitchen where the dirty dishes are stacked or go down the hall to use the smelly bathroom with the leaky faucet and toilet that won't stop running. The rest of Detroit is still like those rooms in your home that haven't been cleaned up enough to allow important guests to visit. Many of the public schools are a mess. There's still an unacceptably high level of violent and property crime. And there are not enough good paying jobs for an impoverished Detroit population. Many of these problems stem from a vicious legacy and current day practice of segregation and exclusion. In many ways Michigan is Mississippi North. But the specific issue of foreclosures is even knottier. Banks have often discriminated against Black customers, saddling them with loans they can't afford. And because the tax base is so shaky in Detroit the city has been resistant to properly valuing homes. 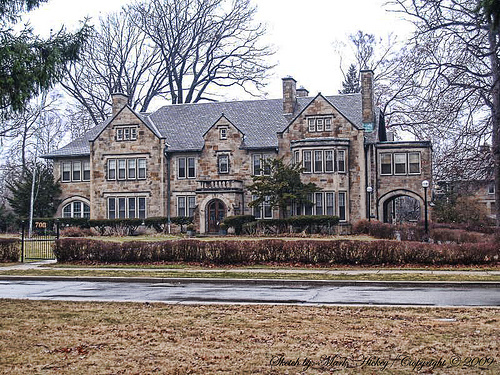 The city and county have overvalued homes in an attempt to strain blood (tax revenue) from a stone (the Detroit taxpayer). This has led to a perfect storm of foreclosures. I suppose from a cold bottom line viewpoint this is what you might call a market correction. But the real deal is that Black homeowners are having their wealth stripped and being converted into renters. Some people are making a lot of money in the process. One in three Detroit homes have been foreclosed on. Check out the short Vice video below which explains what's happening. Unlike with the big banks no one is talking about forgiving debts owed by the little people. If you can't pay the taxes on your home you will lose it. Next! In the last 15 years, one in three Detroit properties have been foreclosed on. When most people think of foreclosure, they think of people who can’t afford to pay off their mortgages. But in Detroit, it’s often the result of people struggling to pay their property taxes. One big reason is that, in the years after the Great Recession, the city went bankrupt and failed to lower property assessments far enough to account for the impact of the housing crisis. While the value of residents’ homes fell, their taxes remained inordinately high, and tens of thousands of people fell so far behind on their inflated tax bills that the county seized their homes and sold them off at annual auctions.